If people do not realize that the day following Halloween is called All Saints Day, even fewer people realize that the next day is called All Souls day. All Souls day is a very specific day within Catholicism. It's a day when we pray for the souls of people who have died before us. But it is not for everybody who has died. We do not need to pray for people who are in Hell obviously because hell is a place of Eternal damnation from which There Is No Escape. At the same time we do not need to pray for the souls of people who are in heaven already because they are already joined in the beatific Vision with God and therefore we do not need to pray for them because they have already attained the ultimate good. Therefore logically speaking the only people that we are praying for during All Souls day are people who are in purgatory. Although like many believes many people have omitted all form of belief and purgatory, it is still very much part of the Catholic and Orthodox religions. Although not exactly the same the Jewish religion also has certain beliefs in a form of purgatory. However I am not an expert in Judaism and so I refrain from going any further than this. Purgatory for Catholics is a place of purification. In fact this is where the very name comes from we believe that people who died not in a state of mortal sin but in a state of grace you have not attained an adequately high level of perfection must go through a purification process. We know this because we know that nothing that is impure or anything that is not perfect cannot enter into heaven. We also know that many people who died are not yet perfect. Therefore we have two options. The first option is to believe that anybody who is less than perfect will go to hell. Many very extreme people have taken this position. However reasonable people who trust in the mercy of God cannot under any circumstances believe in such a strict belief system. Therefore because God is merciful he allows people to enter into his kingdom even though they are not yet perfect. It is precisely in purgatory that they attained this perfection. Therefore on November 2nd remember to pray for the souls of people who have died. We have no way of knowing if any particular individual is actually in hell. And for the vast majority of people we have no certain way of knowing they are in heaven. Therefore we can pray for the vast majority if not all people who have died except canonized saints. However let's not just use this most blessed day to only pray for people who have died. Let us in fact use this day to contemplate our own mortality. We too shall face our own demise and will one day be faced with judgment. Will we be condemned to hell or will we ultimately be destined for heaven even if along the way on that Journey we must be purified? 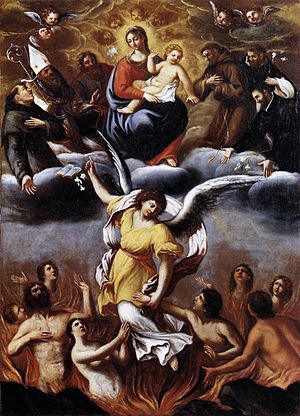 Holy Saints throughout history have received Revelations about the nature of purgatory and it is spoken about to some degree so very little in the Bible both in the Old and New Testaments. Generally what they reveal is that Purgatory is a sort of Bittersweet place because while on the one hand there is great pain and suffering torments of many types as our sinful tendencies are violently ripped from our bodies from our minds and from our souls at the same time these tortured Souls are comforted in the knowledge that their ultimate destination is an eternal peace and joy greater than anything that could ever be attained on earth with the Holy Trinity. Happy All Souls day everybody.